Favourites posts are probably some of my favourite's to write and definitely some of my favouite's to read! I love sharing the products/things which are top of my list for the month! 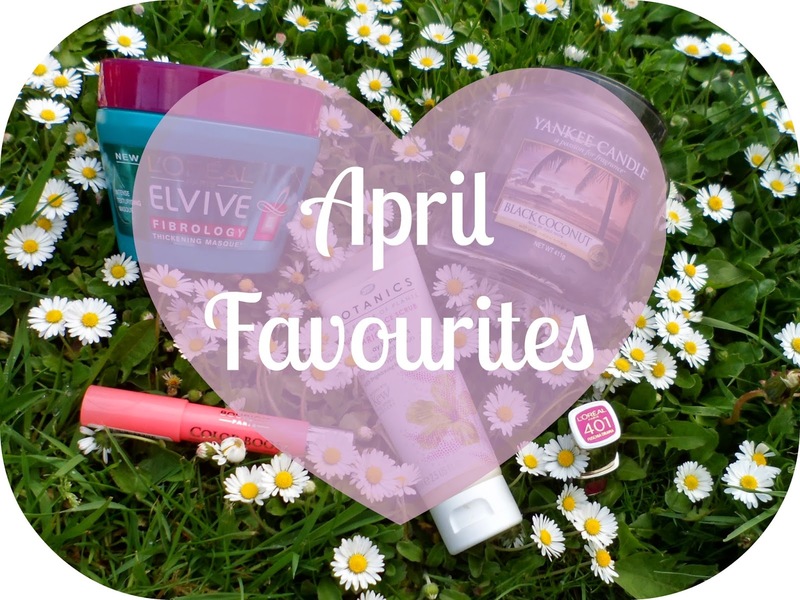 As always most of my favourites this month are beauty related (duh) but of course there are a few other things sneaked in there! It wasn't long ago that this was featured on A Yellow Brick Blog (post here) but it has to go in my April favs! I've been wearing this ALOT since buying it a few weeks ago! Love love love, fab colour, fab product! Possibly the best lip crayon I've used so far. 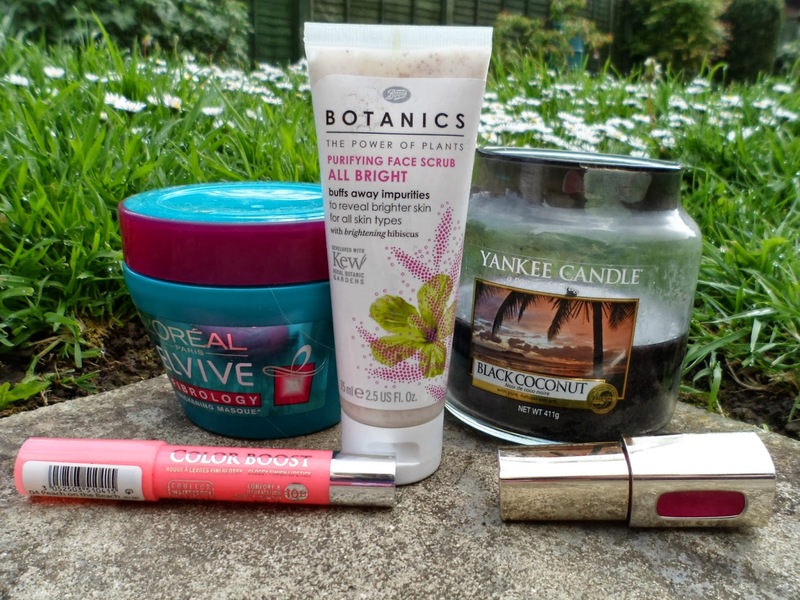 You may have seen this in my Boots Haul this month and I have been saving to talk about it until now! After the first us I knew this was going to be in my monthly favourites! This stuff smells lovely and left my hair feeling so soft, smooth and healthy (although I haven't noticed any major change in the thickness yet!) I have been using this once a week and cannot rave on about it enough.... and I got it when it was half price so even better! A skincare favourite now. I bought this along with the matching face wash and they have had a firm place in my shower ever since. The wash is something I use daily-every other day (I tend to alternate with others) in the mornings and the scrub is something I use probably once a week! It leaves my skin looking and feeling refreshed and they aren't expensive at all - I am very lucky with my skin so I don't feel like I have to splash out on anything too expensive, it is something I will definitely repurchase. I'm all about smells. Products - first thing I check out is the scent, perfumes - so much love for perfumes ..... smells are something I just notice alot. So moving into my own flat I am always obsessed that it smells nice. Queue an aray of yummy candles. I love candles and this one has been burning bright alot this month! I may have actually shown this in a favourites before or maybe in a haul but nethertheless - it's here again. A strong, coconut scent which really lasts - this is so yummy! And lets face it ... everyone loves a yankee candle! TV show now. 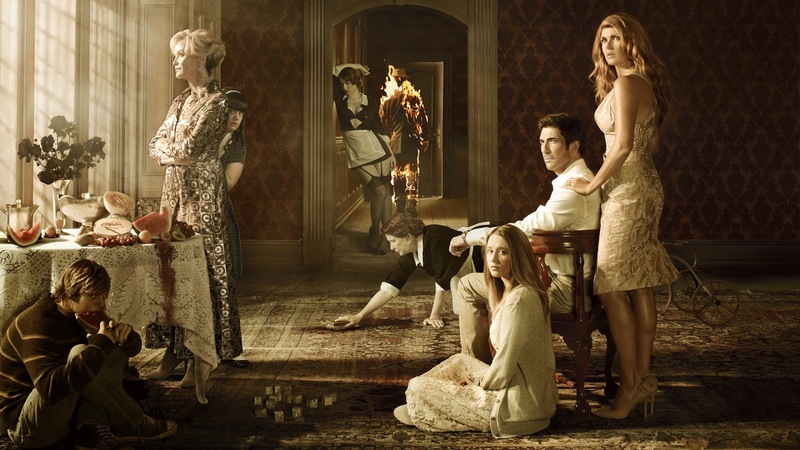 AHS is something I have been wanting to watch for years an years but I have been too chicken to watch alone. Haha I know - what a wimp! So when the boyf agreed to start the first season with me on Netflix I was super excited! Since then we have watched season 1, season 2 and are now half way through season 3! This show is brilliant.... some of it a bit bloody weird but it is amazing! I love that each season is totally different but they keep the same cast! I have alot of love for Evan Peters right now! I've watched all the AHS. The intro gets me, with the creepy dripping water music and the different variations of scary people. Season 3 isn't as good as season 2, but its still worth watching :) lovely post! Just stumbled upon your blog over Twitter, I loooove your header, very cute! Black Coconut is one candle I've never gone for, I never know how it'll smell, but you've def made me want to give it a try now!! Honestly it's sooooo nice - as long as you like coconut! That candle looks incredible! I am skeptical about 'thickening' products though lawwwd knows my hair needs it :/ just need to find one that actually works! !